On July 4, 1776, the “United States” declared its independence from England. Today, we celebrate the day with fireworks and lots and lots of grilling! I can remember, growing up, the day was spent swimming in our pool, lazying around in the spa, and having hamburgers, hot dogs, macaroni and potato salads, and baked beans! This year, I think I’m going to make Bratwurst with caramelized onions and spicy mustard! I love grilled Bratwurst and it’s a nice change from the usual hamburger/hot dog routine. Of course, I’ll have to stake out the lonely charcoal grill at our apartment pool in order to make them! I’m a big potato lover, and since we’re doing Brats, I’m thinking of doing a German-style potato salad (you know, one that is sans mayonnaise, one of my food enemies). Anyone have any good potato salad recipes (if they’re German, that would be AWESOME)???? I’m also thinking of doing deviled eggs. I know they’re kind of an Easter thing, but they’re just so darn good (and easy!) I’ll post a recipe for some soon. I’m thinking of stuffing mine with green olives and bacon. We’ll see. Coat glass rims with Pop Rocks by dampening with lemon juice, then dip the rims in the crushed candies on a place. 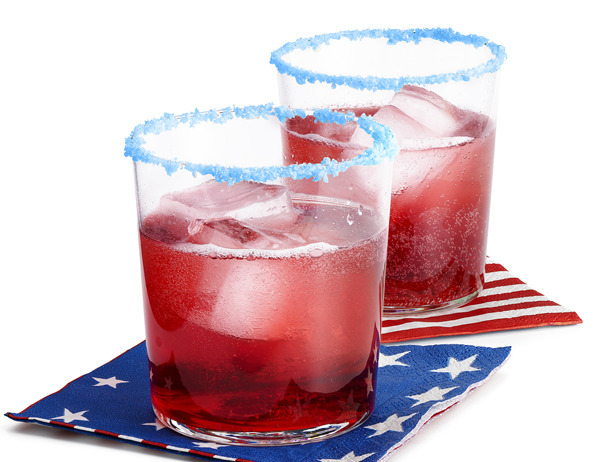 Use Tropicla Punch (blue) Pop Rocks, then fill the classes with any red drink or cocktail; suggestion: mix pomegranate and cranberry juice with seltzer; my suggestion: throw in some watermelon vodka to make it an “adult” drink! I’m definitely going to try these out tomorrow. Any more tips or tricks for 4th of July foods, please comment! And have a wonderful, safe, happy Independence day!